I was surprised to find a picture of a shoe like the one below in a fashion magazine layout last year. 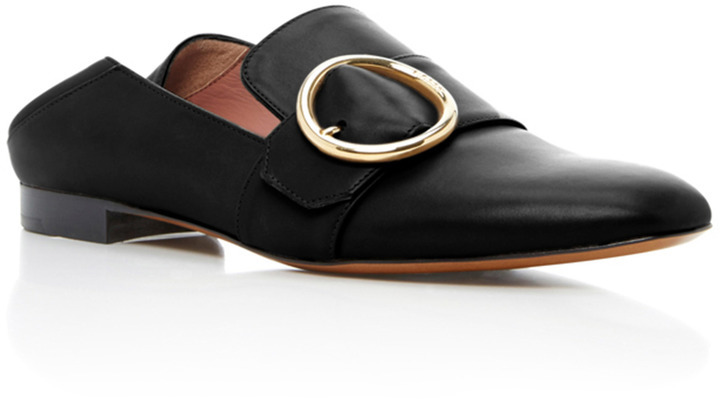 The shoe reminded me of a pair of loafers I owned in college. They were cheap — like many college students, I had a limited budget — and the leather behind the heels got stretched and flattened, rendering the shoes useless for hiking across campus. During senior year, I used them as shower scuffs. When I saw the picture, I thought to myself, nah, nobody would make a $700 pair of designer shoes with the backs flattened on purpose. That’s crazy thinking. But I was wrong. Recently I saw this pair of also-expensive shoes. 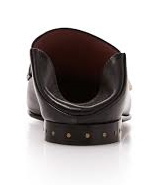 Then I looked around online and found many other shoes with deliberately squashed backs. Here are a couple examples. 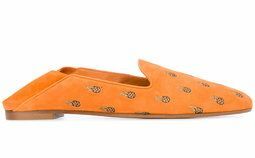 I’m not naming designers here, but let me say that these seemingly impractical shoes can be found in many colors and, at prices ranging north of $500. If you want a pair, you’re going to have to find them on your own. I do not recommend them. 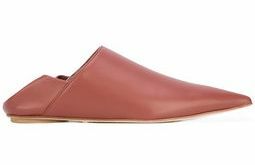 Here is a spring shoe that really does look like a shower scuff. It’s a bit less expensive, about $300 a pair, which is more than I’d spend on a pair of shower scuffs, even in pink suede. Here is an illustration from the designer of how the shoes might be worn. It appears that the back strap is there only for show. The look is very casual, almost sloppy, but it has been shown with actual dresses that might be worn to social events. Go figure. If you like this sort of thing, I say, go for it. As for me — been there, done that. Note: Sorry yet again for the bad paragraph spacing. I’m pretty adept with spacebars and return keys, but WordPress is not.